Your Earth and This Universe. You can do that quite well Yourselves. Out of the Power and Beauty of Your Love. We are here to remind you of Who You Truly Are. My Adventures With The "P's"
Even after 8 years as a channel for them, and in Service to the Light with them, I am still learning more all the time, about who and what the Pleiadians exactly are. They came into my life, after 5 years of studying with other channeled teachers. (See My Journey) Their presence in my life was totally unexpected, and has been dramatically empowering, deeply challenging, profoundly healing, and lots of fun! They have been My Guides, who come to me as an Energy, and Feeling, of Love and Support. Whenever I focus on them, they are there. I've never seen them, or met them, in the Physical or even in Dreams, that I can recall, except through their blending with my own consciousness during channelings. Their "Energy" has always shown up, whenever I request them to, no matter how I am feeling, at the time. They have always been loving and positive, creative and compassionate, and being a channel for them has allowed me more freedom and opportunity than I've ever known. Including the ability to do some amazing and wonderful things, as well as learning how to be of service to others, which I consider their single greatest gift to me. There are three main ideas I want that to share on this page, which I've learned from the Pleiadians, and through being of service with them. Is A/Part of All That Is! Consciously Connected to Our Oneness. it would have been Unbearable for us to be separate while still remaining completely aware of our Oneness. we forgot what we forgot. In The Midst Of All The Darkness. by the light of your heart. The Love that Guides us Home. Through Our Service To All That Is. The Native Americans, the Aboriginals, Africans, Egyptians, Mayans, Aztec and Incans all claim, quite privately, to have a connection to the Pleiades, and the beings that come from there. The Pleiadians have a deep connection with many of the indigenous and tribal peoples of the world. They are often considered either the source of creation and life, (though they know they are only a part of God/Goddess/All That Is) for much of those traditions, and/or they are known as the Star Brothers and Star Sisters of these people, and a source of profound wisdom, assistance, and healing, for them, and for the Earth and the Heavens as well. Other tribal peoples who's existence predates recorded history, like the Dogon of Africa, have spoken quite persuasively, about their connections with other Star People, the Sirians, who have also pervaded many ancient cultures, with great Love and Wisdom. Both Lazaris and Drunvalo Melchizadeck, suggest that the Sirian Beings Of Light, are the Highest Connection we have to the Oneness, from which we emerged. The Pleiadians, I have been told and believe, are a bridge, for Humanity, between where we are now, and the Highest Reality that we can imagine, and beyond. I am just touching here on information that can also be found abundantly in other sources. The Sirians and the Pleiadians are the most common Star Beings mentioned through Star Knowledge. But there are many other Galactic Cultures as well. (See Below.) The "seeds of higher consciousness" have been sown, or hidden with in our DNA, emotional bodies (see Grief Work on the Healing Men's Page) and in our Unconscious Minds, not from us, but by us. We are the first generation in our 'recorded history' who have integrated enough of our Soul/Sprit/Light, back into the Physical/Emotional/Mental, to be able to work with the level of Light and Love that these Beings represent. To connect with a being from another reality requires the ability to disconnect from this one. Which takes great Faith and Courage. There is Overwhelming Evidence, of the presence and the influence of the Star Beings in particular, and Higher Consciousness, in general, in the Creation, of the Earth and of Humanity, and in our History, Present and Future. A lot of this evidence is coming to light now, because It's Time. There's been a great deal written about this, of which I have barely begun to scratch the surface. But my interest so far, has been much more experiential, IE. healing and opening, rather than scholarly. Sphinx, according to Edgar Cayce, (the most accurate channel ever recorded,) says they will be opened in our time, and the evidence found there will make an irrefutable demonstration of this claim. A very big part of the story of our time, is the Reemergence of the "Star Seed Consciousness" of Humanity- the Realization that We are made from Light, (the stars) and that we are not alone, in the Universe(s). As I mentioned in Part One-The Big Picture, Humanity, along with many other Star Beings, including The Pleiadians, the Sirians, Orions, Acturians, Andromedeans, and many other beings created themselves and their worlds in order to learn about being physical-separation, and free will through all our/their choices, and experiences. As far as I have been told, all of the above Star Groups have already Ascended. They've raised their consciousness back into a much deeper awareness of their relationship with All That Is/Uncond-itonal Love. This is also true of other groups of Humans, like the Lemurians, some of Atlantis, as well as the Mayans, Incans, Anasazi, etc. This time is Our Time of Awakening, Remembering and Becoming Free. supporting us to Achieve it. No-One and Nothing Can Stop It. what we are poised to do! Creating a World Unlike Any That Has Ever Been. is to become a Star. A World of Light and Love. than in any time in recorded history. Do you remember the scene from the film Contact with Jodi Foster? She's taken the trip, which didn't happen in time, and she's arrived at the beach, which is located in her mind, and not in space, and the shimmering image of something in the distance, becomes her Father, who died when she was a child? For me, this is the closest approximation of what feels true about our relationship with the P's and other Star Beings. Do they look like the illustration on this page? I don't know. Can they do what Carl Sagan imagined in Contact? I don't know. What I do know is that the love from them is, at times overwhelming. At every channeling I've done with the P's I always come out of trance and watch, sometimes for minutes, who ever I've worked with, deeply connected to this love and peace. And they always want it to continue. There are many people who have very convincing stories and photos of personal contact with Pleiadians, Billy Meir from Switzerland, being the best known. But there are many others. Most of the books and photos by Meir are either on the net or disappeared. It's very hard to find the original published materials from the 70's. Randolph Winters is another very knowledgeable speaker on all things Pleiadian, including Meirs. Though he doesn't believe in channeling, but I won't hold that against him. His book Pleiadian Agenda is available. And I've heard of a man in Miami who's frequently taken up on ships, and have seen the amazing video tape to prove it. And I've met several other contactees. But as I've said, they're very discreet and selective about who they contact and where and when. The Native Peoples that I've had the privilege to meet in the last several years, connect with the "Star People" on a very regular basis. It's a big deal, and they don't sell tickets. It's a Sacred Experience. They do it to Heal and to Learn. This is little known outside their circle. But that's starting to change. Standing Elk of the Lakota Sioux was instrumental in creating a life changing experience for several hundred people in Yankton South Dakota, at the Star Knowledge Conference in June,1996. The Conferences have continued since then. For me it was a unique opportunity to learn more about Star Knowledge firsthand. There has, of course, been a lot of controversy, debate, and cover ups surrounding these contacts, just as with all the other info regarding ET contact. There also seems to be very strong evidence to suggest that there are light and dark ET's, just as there are in all the rest of us. I have been fascinated with Whitley Strieiber's Communion and other books describing connecting with the Gray's and describing his experience as a "Spiritual Journey". However, with all things of Spirit, Intention, is the single most powerful tool. If you are clear what you want to meet, and why you want to meet these other aspects of All That Is, I have seen it happen. These experiences are not always as simple as people expect. I have some close encounters that were quite surreal and fuzzy, while other more experienced people with me, at the same event, have had clear and wonderful connections. ET's live in a very different though very interconnected reality with ours'. The New World Will Be Born. Humanity has had a very long history of giving it's power away. We've done this throughout the Bible, seeking God to "save us" from ourselves, and we've done this in our social and political structures, from warring tribes to warring nations. 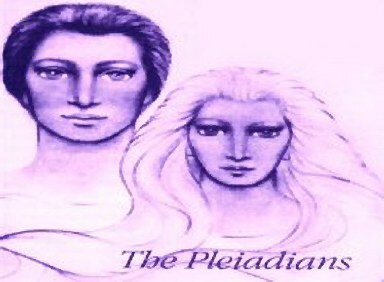 ET's such as the Pleiadians, who are "of the Light", are only interested in us as equals. This is an idea that has a long way to go, in a necessarily short period of time, as our world moves towards DEC 21, 2012, the time when all of my Guides suggest the New World Will Be Born. Visualizing a pillar of golden light, which emerges from the Central Sun. We see that light spiraling through time and space and gently touching the crown of our heads. As we feel the light there, we take a deep breath and allow the light to flow through our bodies, aligning our 7 chakra centers, and connecting with the Crystalline Core of Gaia/Mother Earth. We feel Safe and Loved and Connected to Our Place of Power. We then visualize the 7 Stars of the Pleiades, likewise spiraling through time and space and likewise, touching the crown of our heads, breathing their love and light in, we allow those 7 stars to align and harmonize with our chakras, and also connect to the Crystaline Core of the Earth. From here we/you can meditate, send out rays of light and love from your heart's center, and/or magnetize more of the qualities and experiences that we/you desire, to express you Love and Light, into Your Life and Your World.